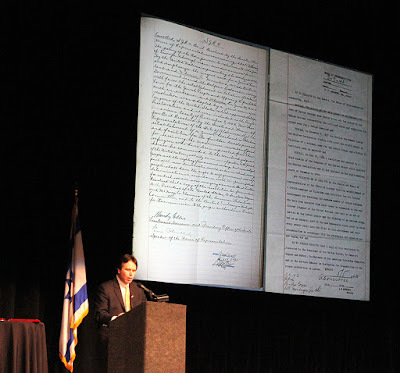 At the March 2014 Alabama-Israel Task Force kickoff, John Buhler speaks about the 1943 Alabama resolution calling for the establishment of a Jewish homeland (file photo). The Alabama Legislature unanimously passed a joint resolution denouncing the BDS movement and reaffirming support for the State of Israel. The BDS movement, which stands for Boycott, Divestment and Sanctions, seeks to isolate Israel economically and academically. Senate Joint Resolution 6 was introduced by State Senator Arthur Orr from Decatur on Feb. 2. The House passed the bill on Feb. 9. The resolution noted the common values held between Alabama and Israel, and reiterates Alabama’s recognition of and support of Israel’s right to exist as a Jewish state. It also mentions how Alabama unanimously passed a joint resolution and “led the nation” in 1943, five years before Israel’s independence, by supporting the establishment of a Jewish state. The resolution said that “the State of Alabama is concerned by anti-Israel activities in this state and other communities nationwide within certain university campuses, academic and professional associations, and the cultural sector” and the overall dramatic increase of anti-Israel activity in academia. Additional support came from the Birmingham Jewish Federation and Foley-based Church4Israel. Many states are passing anti-BDS bills. In April 2015, Tennessee became the first state to formally condemn BDS, by a combined 123-1 vote between the two houses. The effort was spearheaded by Laurie Cardoza-Moore, founder of Proclaiming Justice to the Nations, a Christian pro-Israel group. She worked with Christian and Jewish groups to promote the bill, which was seen as a template for other states to follow. On Jan. 25, the Indiana House passed a bill barring the state’s retirement system from investing in businesses that engage in action to boycott Israel. Florida passed a resolution requiring a state board to identify publicly-funded companies that are engaging in a boycott of Israel, and South Carolina has also passed similar anti-BDS legislation. PJTN's Board Chairman, Stanley Tate, stated "Alabama and Israel have enjoyed a long history of friendship and are great allies of our shared Democratic values." Mentioning the 1943 resolution, he added, "That's a miracle! No other state shares that unique history." Cardoza-Moore said the passage of Alabama's resolution "can serve as a positive example and concrete model of a firm step that other state legislators can take as we begin to expose the malicious intent of the BDS campaign and confront it head-on! With 70% of Americans supporting Israel, I am calling on Christians, Jews and people of conscience to add their voices to this groundbreaking initiative."